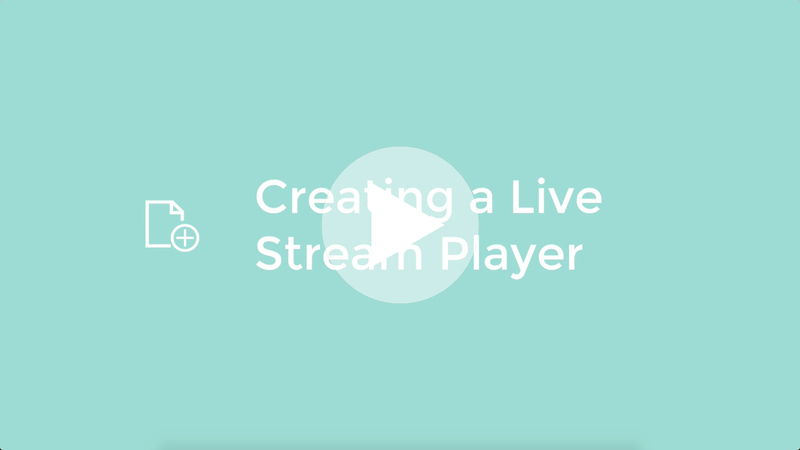 Here you can create a Live Stream Player to broadcast a Live Stream from your RTMP Software or Hardware encoder. In this article you will learn how to create a Live Stream player to which you can stream your Encoding Software, Encoding Hardware or even your Webcam. If you want to check out some demos and and extra information please visit our Live Streaming information page. Now click on the ➕ Add Media button located on the top Media view. Now select the 🎥 Live Stream tab. Here you can enter a Title to identify your Live Stream Player in future. Destination; Here you can choose if you wish to add the newly created Live Stream Player to the Default Playlist which is the where any videos that are not part of a specific playlist will be located. Or if you wish to add the Live Stream Player to a specific playlist. Now simply click on the green ☑️ Save button to create the player. You can obtain the basic RTMP details by highlighting your new player in the media view then clicking on the 🎥 Live Studio button in the top of the media view.